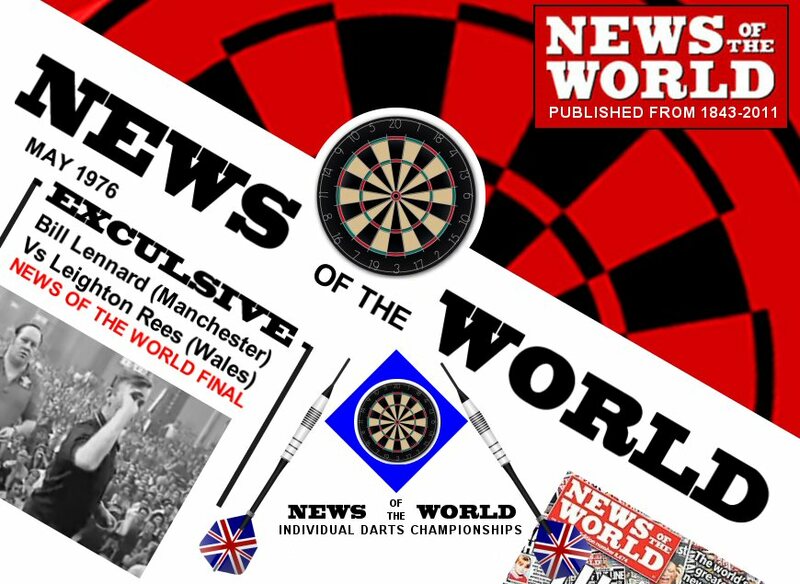 The "News of the World" [*] individual Darts Championship was the first organised darts competition, which first started in 1927 and was originally only a London competition. 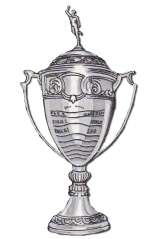 From 1936-39 the tournament expanded and individual regions held their own competitions. The competition then stopped during the second world war years before returning as the News of the World National Championships and it became one of the World's biggest darts tournaments. The tournament was notoriously difficult to win. Each round consisted best of legs and was played from an 8ft (Hockey) Oche length not the 7ft 9 ¼” (2.37m) used as the standard today. In 1986-7, Bobby George won the event without conceding a single leg during all rounds of the competition. The latter stages News of the World Darts Championships was also broadcast by ITV and was a feature of ‘World of Sport’ 1972 to 1985, and again in 1987 and 1988. The 1986 event wasn't broadcast due to a technicians' strike. There was a big slump in televised darts and the competition ended in 1990 but returned for the last time in 1996/7. The men's competition was won by Phil Taylor and the ladies by Linda Jones. It is still said to be one of the hardest competitions ever to have won. 1927-28 Sammy Stone (New South-West Ham Club) beat B Haigh (Victoria Inn, Kensington). 1928-29 J Hoare (Duke’s Head, East Twickenham) beat L Lee (New Eltham SC). 1929-30 C Bowley (Shakespeare’s Head, Finsbury) beat W H Gentry (St Pancras) 2-0. 1930-31 Tommy Nye (Tankerville Arms, Kennington) beat R Wright (Hampstead) 2-0. 1931-32 Jack Hood (Hood’s Dartboards, Bow) beat George Branch (Tottenham) 2-0. 1932-33 Kenny Enever (Bull, Mitcham) beat F Wearn (Bricklayer’s Arms, Putney) 2-1. 1933-34 Fred Metson (Hanbury Arms, Islington) beat W Rossiter (Wellington, New Cross) 2-0. 1934-35 Billy Forecast (Duke of York, Bow) beat Jim Pike (Hope, Carshalton) 2-0. 1935-36 Peter Finnigan (Eight Bells, Tolworth) beat Albert White (Weaver’s Arms, Islington) 2-0. 1936-37 Stan Outten (Seven Kings Hotel, Ilford) beat T Hares (Stag & Hounds, Ashford, Middx) 2-0. 1937-38 Fred Wallis (Railway Hotel, Eastbourne) beat F E Betts (Waterman’s Arms, Norwich) 2-1. 1938-39 Marmaduke Breckon (Jolly Sailor, Hanworth) beat Jim Pike (Windmill Club, Southwark) 2-1. 1936-37 D Cornacia (Ivy Bush Hotel, Pontardawe) beat T A Jones (Llanerch Hotel, Llandrindod Wells) 2-0. 1937-38 Gwyn Jones (Unemployed Club, Penygraig) beat Jack Gorvett (Ferry Boat Inn, Briton Ferry) 2-0. 1938-39 Charlie Parker (Castle Inn, Pontywaun) beat Horace Trickett (Old Express Hotel, Merthyr) 2-0. 1937-38 Sam McIntosh (Duke of York, Salford) beat Luke Ratcliffe (Commercial Hotel, Oldham) 2-0. 1938-39 Peter Birchall (St Peter’s Liberal Club, Oldham) beat Jack Kirk (Sandon Arms, Heswall) 2-1. 1938-39 Harry Prior (Duke’s Head, Polebrook) beat H Ball (Gardens Hotel, Stapenhill) 2-0. 1938-39 Jimmy Young (Wheatsheaf Hotel, Newcastle-u-Tyne) beat Tom Steel (Atlantic Hotel, West Hartlepool) 2-1. 1938-39 Jim Munroe (Vine Tree, Wakefield) beat George Johnson (Fisherman’s Hut, Leeds) 2-1. 1948-49 Jackie Boyce (New Southgate SC) beat Stan Outten (Dr Johnson, Barkingside) 2-1. 1949-50 Dixie Newberry (Albert, Hitchin) beat Ronnie Ridley (King Edward Hotel, Newcastle-u-Tyne) 2-0. 1950-51 Harry Perryman (Home Office SC, Greenford) beat Laurie Runchman (Feathers, Felixstowe) 2-0. 1951-52 Tommy Gibbons (Ivanhoe WMC, Conisbrough) beat Jack Wallace (Low Seaton BL, Workington) 2-0. 1952-53 Jimmy Carr (Red Lion, Dipton) beat Ernest Greatbatch (Horse Vaults Hotel, Pontefract) 2-0. 1953-54 Oliver James (Ex-Servicemen’s Club, Onllwyn) beat Johnny Bell (Sun, Waltham Abbey) 2-0. 1954-55 Tom Reddington (New Inn, Stonebroom) beat Johnny Bell (Sun, Waltham Abbey) 2-0. 1955-56 Trevor Peachey (Black Fox, Thurston) beat Les Campbell (Boot, Dinas) 2-0. 1956-57 Alwyn Mullins (Traveller’s Rest, Tickhill) beat Len Baker (Corporation Hotel, Cardiff) 2-0. 1957-58 Tommy Gibbons (Ivanhoe WMC, Conisbrough) beat Eric Moss (Railway Tavern, Harleston) 2-0. 1958-59 Albert Welsh (Horden Hotel, Seaham) beat Frank Whitehead (White Rose Hotel, Rossington) 2-1. 1959-60 Tom Reddington (George Hotel, Alfreton)beat Dai Jones (Cambrian Hotel, Aberystwyth) 2-1. 1960-61 Alec Adamson (Prince of Wales, Hetton-le-Hole) beat Eddie Brown (Magpie, Stonham) 2-1. 1961-62 Eddie Brown (Magpie, Stonham) beat Dennis Follett (Cadeleigh Arms, Cadeleigh) 2-0. 1962-63 Robbie Rumney (Waterloo Hotel, Darlington) beat Bill Harding (Globe Hotel, Aberdare) 2-0. 1963-64 Tom Barrett (Odco SC, London) beat Ray Hatton (Flower of the Valley Hotel, Rochdale) 2-0. 1964-65 Tom Barrett (Odco SC, London) beat Norman Fielding (Station Inn, Swannington) 2-1. 1965-66 Wilf Ellis (Brookside WMC, Upton) beat Ron Langley (Arlington SC, Harlow) 2-1. 1966-67 Wally Seaton (Swan, Parson Drove) beat Brian Quarterman (Ivy Inn, North Littleton) 2-0. 1967-68 Bill Duddy (Rose & Thistle, Frimley Green) beat Gerry Feeney (Unicorn Club, Workington) 2-0. 1968-69 Barry Twomlow (Red Lion, Chesterfield) beat Paul Gosling (William IV, Truro) 2-0. 1969-70 Henry Barney (Pointers Inn, Newchurch, IoW) beat Alan Cooper (Plough, Filton) 2-0. 1970-71 Dennis Filkins (Barrow, Hepburn & Gale SC, Bermondsey) beat Derek White (Ship, Weymouth) 2-0. 1971-72 Brian Netherton (Welcome Home Inn, Par) beat Alan Evans (Ferndale Hotel, Rhondda) 2-0. 1972-73 Ivor Hodgkinson (Great Northern, Langley Mill) beat Ron Church (Royal Alfred, Shoreditch) 2-1. 1973-74 Peter Chapman (Bird in Hand, Henley) beat Paul Gosling (Portscatho Club, Truro) 2-1. 1974-75 Derek White (Belvedere Inn, Weymouth) beat Bill Duddy (Frimley Green WMC) 2-1. 1975-76 Bill Lennard (Cotton Tree Inn, Manchester) beat Leighton Rees (Ynysybwl USC, Pontypridd) 2-0. 1976-77 Mick Norris (King of Denmark, Ramsgate) beat Bob Crosland (Blackamoor Head, Pontefract) 2-0. 1977-78 Stefan Lord (Stockholm Super Darts Club) beat John Coward (White Hart BL, Sedbergh) 2-0. 1978-79 Bobby George (King George V, Ilford) beat Alan Glazier (George & Dragon, Wetherby) 2-0. 1979-80 Stefan Lord (Stockholm Super Darts Club) beat Dave Whitcombe (Naval Club, Chatham) 2-0. 1980-81 John Lowe (Willow Tree, Pilsley) beat Mick Norris (Earl St Vincent, Ramsgate) 2-0. 1981-82 Roy Morgan (Wheel o’ Worfield, Worfield) beat Jim Hughes (Parcwern Country Club, Ammanford) 2-1. 1982-83 Eric Bristow (Foaming Quart, Norton Green) beat Ralph Flatt (Old Red House, Carlton Colville) 2-0. 1983-84 Eric Bristow (Milton Hayes BC, Stoke-on-Trent) beat Ian Robertson (Bell, Marston Moretaine) 2-0. 1984-85 Dave Lee (Ivor Arms, Pontllanfraith) beat Billy Dunbar (Woolwich Infant, London) 2-0. 1985-86 Bobby George (Old Maypole, Hainault) beat Rick Ney (US Darting Association) 2-0. 1986-87 Mike Gregory (Stones Cross Hotel, Midsomer Norton) beat Peter Evison (Halcyon/Spikes, Peterborough) 2-0. 1987-88 Mike Gregory (Stones Cross Hotel, Midsomer Norton) beat Kevin Spiolek (Cambridge Squash Club) 2-1. 1988-89 Dave Whitcombe (King’s Head, Ipswich) beat Dennis Priestley (Horseshoe, Rotherham). 1989-90 Paul Cook (Gorse Hill WMC, Swindon) beat Steve Hudson (Oakworth SC, Keighley). 1989-90 Ladies:Lynne Ormond (George, Alford) beat Jane Stubbs (Roebuck Hotel, Northwich). 1996-97 Phil Taylor (Cricketer’s Arms, Newcastle-under-Lyme) beat Ian White (Dockside Inn, Runcorn) 2-0. 1996-97 Ladies:Linda Jones (Seven Stars, Chorley) beat Melanie Saunders (Railway Inn, Abergavenny) 2-0.